RRP $50. Web Price $45 (in Australia). 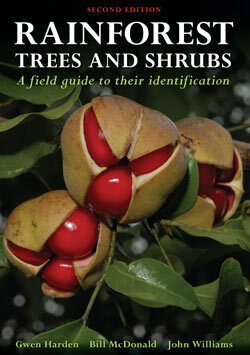 A revised edition of the Field Guide to the identification of rainforest trees and shrubs of Victoria, N.S.W. and sub-tropical Queensland using vegetative characters. Most traditional floras or identification guides to plants use flowers and fruits as the main means of identification and recognition as these are the most obvious and stable parts of the plant. However, in rainforests the flowers and fruits are usually held high in the canopy of the forest and so difficult to collect and thus determine the name of the plant. Also, flowers are usually seasonal and produced on the plants for only a short time, either each year or every few years. The system used in this guide is based on the details of the leaves and branchlets. Leaves can readily be collected from young plants, from trees on the edge of the forest or picked up from the forest floor. This system was largely developed by the late John Williams (of the University of New England, Armidale). Each species has line drawings of leaves and fruit and a description of its main features, its geographic distribution and the type of rainforest in which it grows. 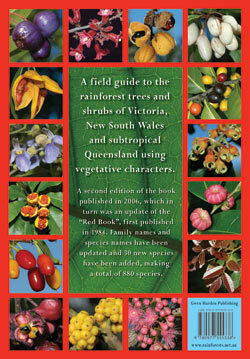 This Second Edition is a revision of Rainforest Trees and Shrubs (Harden, McDonald & Williams), first published in 2006. Which in turn was the successor to Trees and Shrubs in Rainforest of New South Wales and southern Queensland (Williams, Harden & McDonald 1984) and was known by many as the ‘Red Book’. These books has been widely used by professional botanists and ecologists, environmental consultants and planners and by rainforest enthusiasts and gardeners.